Jim Clements, project manager for Boston College's Media Technology Services group, make final adjustments to the new podium-based control center in one of 11 caserooms at the Carroll School of Management. LARGE-SCALE TECHNOLOGY integration projects can be costly and time-consuming, require crystal-ball peering, and demand everyone’s two cents. Few fit that definition better than smart classroom/training room projects. Entailing the introduction of AV and IT gear that permits ease of use, functionality, and flexibility that enhances teaching and instruction across multiple venues, shepherding those projects pose major challenges for technology managers. AV Technology asked four such managers how they approach smart classroom projects. David Corkum is the director of media technology services at Boston College, Chestnut Hill, MA. Kevin Bradley is vice principal at Hoover High School, Fresno, CA. Michael Bialas is IT services administrator at Anadarko Petroleum, The Woodlands, TX. Bruce Ritchie is technical support supervisor/classroom design specialist at Northeastern University, Boston, MA. Each has played a central role in rolling out extensive smart classrooms/training room projects in their organizations. Here’s what they had to say. AV TECHNOLOGY: Getting instructors comfortable with smart classroom technology is essential. How important is training and instruction, and how do you address that in your organizations? Dave Corkum: We rolled out a classroom technology standards project five years ago to make it easier for faculty to operate the systems and encourage its use. But first and foremost was providing training so they're comfortable using it. For new users we find one-on-one training is more effective than group training. The less technologically inclined start out slow typically, but once they see the advantages they embrace it in their teaching. Bruce Ritchie: A system that's easy to figure out is the first priority. But at the beginning of each term we meet with the faculty and walk them through the systems and note any changes. Plus, two years ago we started offering a complete online guide to operating each type of room system. The descriptions are pretty detailed - a picture or drawing of the operational control system and where the buttons and cables are. Kevin Bradley: A staff development program is key. Too often, money is spent on this technology, but there's no training follow through. So, in rolling out smart rooms at our first high school, we identified instructors who could be "technology mentors." They were the initial users in the phased rollout and they helped bring others along. Another aspect is offering training during the summer and the school year. That has evolved from covering basics to how to better incorporate technology into specific curriculums. So it's training and user-friendliness. How do you ensure the latter? Michael Bialas: The control system is the key element. In conjunction with putting system controls in users' hands, we try to simplify and minimize the amount and number of controls needed. I don't want someone to have 20 different I/O options, but rather a simple set of buttons on a product like the Extron MLC 104. As soon as we start putting in multiple remotes, input panels, and switches it suddenly doesn't feel like a smart facility. Corkum: Our standards project resulted in technology standards of varying complexity for three types of venues - basic classrooms, casework rooms, and auditoriums. The goal was to make each of them as simple as possible for users, but also to outfit them with the equipment and controls tailored to how instructors want to use the technology. A room can have all the bells and whistles, but if an instructor won't learn to use them, it won't do much good. Ritchie: We've got to make the technology as foolproof as possible, so we go with system gear that's simple to use. But it all revolves around standardization. Standardizing allows users to expect and plan on a certain amount of technology being available. That, more than anything, encourages use. Bradley: You have to break down barriers to using it. Before we start- Jim Clements, project manager for Boston College's Media Technology Services group, make final adjustments to the new podium-based control center in one of 11 caserooms at the Carroll School of Management. Photo courtesy of Boston College. ed standardizing, presentation technology was very awkward in terms of setting up and breaking it down in a room. Making technology the same from room to room helped demystify it and encourage usage. Incorporating the right supporting gear is also important. A component of all rooms now is a tablet PC that mimics a whiteboard or a chalkboard. How do you approach technology upgrades in the context of the need for standardization and functionality, but also budget constraints that may necessitate a phase-in? Corkum: One component of a smart room is the ability to support emerging technologies. If a faculty member requests a new technology, we may experiment with it in one room on a test basis. The school of management wanted a podium-based system and we looked at some different options. In the end, we replaced an 8-year-old room system there with an entirely new one. Now we're evaluating other new technologies for other rooms, like classroom capture, IP video, and audience response systems. Bradley: In the course of phasing in smart rooms in two high schools - one of which is complete -we're going to reach a point where we'll have some that are outmoded. But worries about obsolescence can't keep you from moving forward. Ritchie: First, we always evaluate whether a change is needed. It's hard to integrate an upgrade in one fell swoop, and you also can't plan too far ahead expecting everything will change. But we figure on projectors maybe lasting four years and changing out a quarter of them a year. Control systems need to be changed every eight years or so. We're not jumping on everything new. We're sticking with VGA inputs and not DVI, and we are putting in Blu-ray inputs on an as-needed basis. What are the critical, core functionalities of your smart rooms, and what products get you there? Bialas: Our goal is to reduce the complexity of our training and meeting spaces. We do that with a basic Extron 104 controller that has hard push buttons rather than a touchpanel for simplicity, a projector, and a laptop computer. Users needing DVD playback can utilize the player built into the PC. Room size drives the microphone and sound system selection. In some larger rooms, where more sophisticated programming and room division is needed, we tie together multiple control systems. Corkum: In general, the rooms are equipped to meet the presentation and learning needs of various users. They're "smart" because they support a wide range of current and emerging technologies. It's basic tech - DVD/VCR, projectors, overheads, displays, audio, microphones, control - in most rooms. 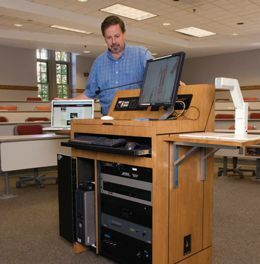 Auditoriums have lecterns with touchscreens, full audio, a document camera, and Smart Technologies' Sympodium annotation. Casework rooms have a smaller podium, computer, and full sound. We're doing a pilot on Tegrity, Echo 360, and Apple Podcast Producer classroom capture so students can get a full online classroom experience. Ritchie: The basic expectation is presentation capabilities with at least minimal levels of connectivity with laptops and video. Some have videoconferencing, audience response, interactive annotation such as Sympodium, and an electronic whiteboard. We use Epson and InFocus projectors. Shure wireless microphones have proven to work well in our "RF soup" environment. We try to have gear that gets us to a tiered level of standardization that allows users to move logically to more complex systems as needed. Bradley: Basically, we want solutions that are plug and play, and not just cool technology. Computer-connected, ceiling-mounted data/video projectors, four ceiling speakers, a centralized control system that's easily accessible, and wireless access are some of the key pieces. When complete, the systems are going to be slightly different in each of the high schools, but all result from a lot of testing, research, planning, and stakeholder input. Given all the smart classroom configuration options and price ranges, how did you go about selecting your solution? Bialas: What's guided us is putting in foolproof systems anyone can work anywhere in the company; products tied to a control system that's easy to program; and spaces that generate minimal tech support calls. Over time, the expectation of technology in training and meeting spaces will become ubiquitous. It'll be a utility, like electricity, that's there at the flip of a switch. Corkum: One guiding part of our approach is not to just randomly throw technology around. But while we have room standards, we don't lock ourselves into a rigid set of equipment. We've developed a set of procedures for the requesting, design, installation, and operation, and a committee reviews technology requests. Ultimately, it's all about the students and using the various technologies to make learning exciting and accessible. Ritchie: The decision to go with smart classrooms was made at the school's upper levels. There was a push for classroom technology ubiquity - making sure that all teachers can instruct using the same basic technology in the same room setting. From that point down decisions about specific technology were made by tech managers and faculty. Bradley: When our first "smart classroom" high school opened in 1999, it was assumed it would be laden with technology from day one. That didn't happen. But as we learned more and technology took hold, we knew we wanted smart rooms. A tech committee saw smart classroom technology in action at California State University, and started mapping out an approach [for us]. It was pieced together over three years. Tom Zind is a freelance writer based in Lee's Summit, Mo. He can be reached at tomzind@att.net.